$22.99 & FREE Shipping on orders over $59 $35. 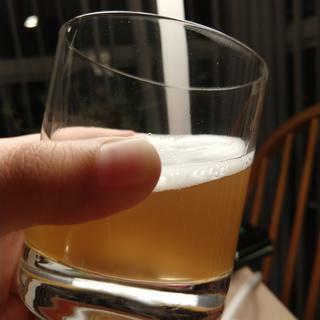 A true German style Hefeweizen recipe using 60% White Wheat malt and 40% 2-Row Lager malt. 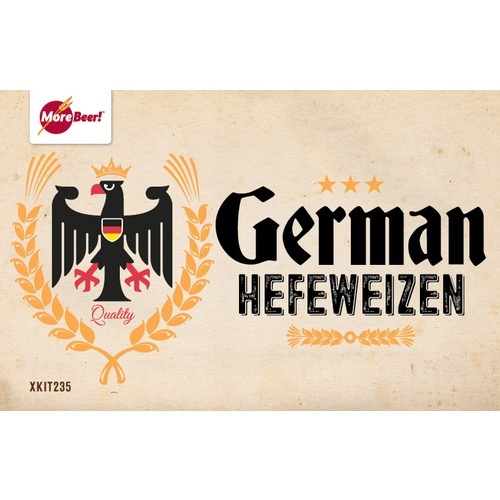 Hefeweizen is a simple yet delicious and refreshing beer for hot weather consumption. We recommend using WLP300 from Whitelabs with this hefeweizen recipe for the classic Weihenstephan German wheat beer flavor. Best results are obtained if fermented at, or close to, 62-64 degrees. Cooler temps help reduce the overwhelming spice and banana tones. *NOTE: If your fermentation goes a little crazy at first, don't fret. Just clean off the airlock and replace it. Because IPA isnâ€™t the only beer in the world, but it seems that way lately. Hefeweizen is one of my favorites. Refreshing and tasty. I used this same all grain kit before and it was very pleasant. Brewed this once before and it turned out great. Brewed previously to great success! Looks like a beer I will love. Favorite beer. Been brewing this for years. I love Hefeweizen and I need a quick turn around beer. 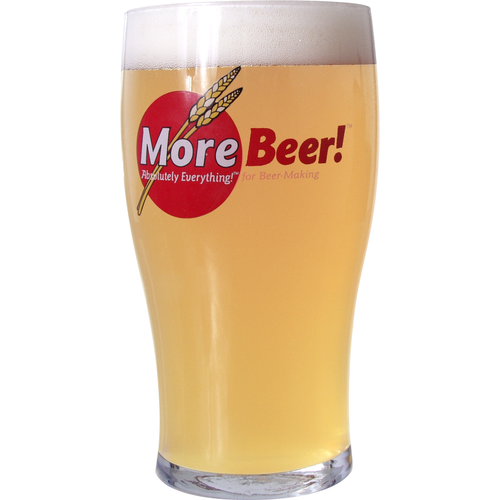 easy, all round wheat ale. Ready to try a lighter style now that I have a ferm chamber. What Would you recommend as a dry yeast for this recipe? BEST ANSWER: For this kit, we recommend the Safbrew WB-06 or the Munich Wheat Beer Yeast by Lallemand. It’s a good kit. I like the grain bill. The only caution is the prescribed yeast. Sometimes the fruity esters from the Hefeweizen yeast can be great but sometimes they are overpowering. It seems to respond wildly temperature variations, so if you can’t control that during fermentation, I would suggest swapping the yeast for a Belgian wheat ale if you can. Thinking along the lines of t 58, and I have a temp controlled space just for fermentation, thanks for the response cheers! Awesome hefeweizen! Came out super tasty. I added about 1/2 lb of rice hulls to prevent a stuck mash. I will be buying this kit again. I liked the higher wheat to barley ratio, and the price is right. I did a hybrid brew in a bag batch sparge method. O.G. was 1.054 final was 1.010. I used Wyeast 3068, 1 week in primary @ 68F then to a keg. Next batch i will try my first single decoction mash. this brewed up very good. I have a robo brew 3rd gen. mashed for 1 hour . brewed for 1 hour and fermented 3 weeks in primary no secondary. kegged for 1 week and tried it and it was great.. This is one the best smelling beers I have ever brewed. During the boil it smelled like fresh sweet bread. During fermentation the combination of the wort aroma and Mangrove Jack's Bavarian Wheat yeast were heavenly. The finished product is awesome! What a great daily drinking beer. It finished at 5% and has great banana flavor with a hint of clove and spice in the background. Why are you still reading this review? Buy this kit! A very easy brew that makes a really classic Hefeweizen: easy-drinking sweet with a thick, creamy head. My friends that don't like beer loved the taste of this and my friends who do like beer kept sneaking into my fridge for another bottle. This is a nice easy brew for the summer, good stuff! Wow, so simple but so good...bring on the hot weather! This beer is super easy and simple...but so good. The head was like whipped cream. I messed with the recipe and doubled the hops. The result was more lemony bitterness...it might mellow but I would not mess with the recipe. It was great, this will be a summer staple...great beer for a pool party. This was only my 4th All Grain batch and still dialing in my brewing process. With the summer weather already here in the North East (Delaware) this Hefeweizen could not come at a better time. Adding some blueberry's and plan to drive the tractor until the keg is gone. I brewed this last January, and I fermented it with blood oranges. I zested the blood oranges, removed the pith, and simmered the zest and chunks of blood orange in a pot while brewing. I allowed that to cool to room temp, and dumped the contents of the pot into the fermenter. It was outstanding....almost like a Blue Moon. The wife has asked me to make it again. This was actually my first all-grain brew and it was wonderful! I used the wyeast hefeweizen to ferment, and would recommend this yeast (haven't tried the white labs however). Definitely plan on brewing this again this Summer! Simple yet produces a great flavor! This is a very easy recipe to make yet produces very flavorful results. The final produces a true hefe flavor with a perfect white head lasting through the whole glass. The bottled result is a very clear beer with a small amount of sediment in the bottom however, pour about 3/4 of the bottle in your glass, swirl the left over in the bottle and pour all of it into your glass. This will result in the cloudy "wheat beer" color you were expected along with that refreshing hefe flavor. Nice!